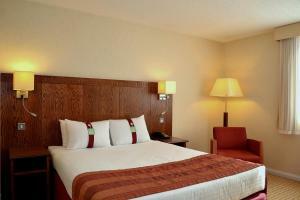 With a riverside setting, the friendly Holiday Inn Northampton is free for the under 12s. It has free parking, a brasserie, a bar and a mini-gym. The rooms are comfortable and nicely decorated and feature both a bathtub and a shower. Tea/coffee making facilities are at the guests’ disposition and there is a work desk in every room. A good breakfast is served everyday from 6:30 a.m. until 10 a.m. at the Holiday Inn Northampton. The brasserie serves a selection of pastas, salads and curries and the lounge bar is an ideal place to relax. 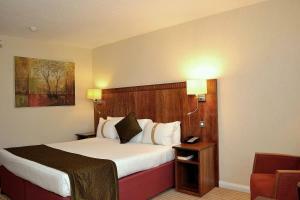 The hotel is just 2 miles from central Northampton and only 5 miles from highway M1. 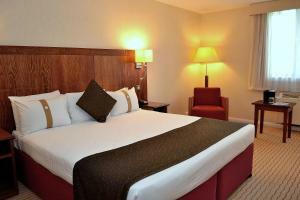 The hotel is within a short drive of the area’s many business parks while Woburn Safari Park and Silverstone are reachable within 30 minutes. Children under 12 years of age can stay and eat for free when accompanied by a paying adult. The most recent booking for this hotel was made on Apr 22 at 16:41 from United Kingdom. These are general hotel policies for Holiday Inn Northampton. As they may vary per room type, please also check the room conditions. All guests on arrival will be asked for a pre-authorization of the room rate unless the room has been prepaid. An additional amount of GBP 50 per night as a security deposit is also taken from the card. If a guest wishes to pay by cash then the full reservation payment will be taken upon check-in. Photo ID will be requested at this time. Please contact the property directly for further details. Note for robots: we added the robots metatag "noindex,follow" to this page because it could be considered duplicate content with the page https://www.booking.com/hotel/gb/courtyardnorthampton.en-us.html which should be in the index.